Screening Notes: What Do We Mean When We Talk About Spoilers? There are spoilers for movies in this article. Mentioning which movies they are for might accidentally spoil those movies just by virtue of pointing out that they might have spoilers in them. 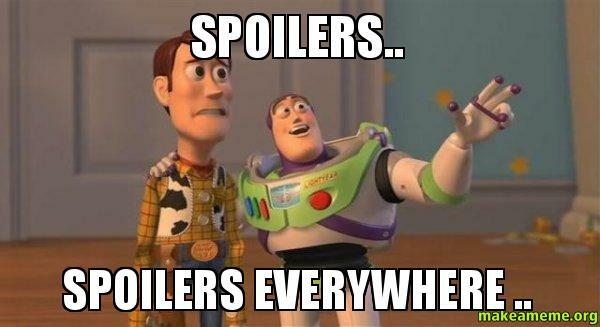 If you are a spoiler sensitive reader, consider yourself warned. Spoiler culture is something that has interested me for a while. It's ironic to me that the majority of folks who consume movie-related media have a voracious hunger for information about upcoming movies before they hit theaters, but those same people are frequently disappointed when they're given too much. My question regarding spoilers is this: if a movie can be genuinely ruined by a spoiler, was it ever really any good to begin with? Obviously there are different magnitudes of spoilers, most of which will simply decrease the amount of enjoyment you get from a first-time watch rather than actually ruin a movie forever. For me, there are three different kinds of spoilers, each of which has a different impact on my impression of a film. The first, and what I think is most often thought of as a "true" spoiler, is the "Bruce Willis is a ghost," ruining-the-twist type spoiler. These can have the biggest effect on first-time watches (i.e., the realization that Bruce Willis is a ghost is kind of magical if it hadn't been spoiled for you), but also shouldn't ruin the movie completely (i.e., going back through and finding all the clues that hinted that Bruce Willis was a ghost can be more fun). If this type of spoiler actually ruins a movie, then I think there just wasn't much to the movie to begin with. I don't think knowing that Bruce Willis is a ghost ruins The Sixth Sense. On the contrary, knowing that enriches subsequent viewings. The second, and what is quickly becoming more common of an occurrence in movie media coverage, is the "Gwen Stacy dies," giving-away-little-details type spoiler. Obviously there's an argument to be had over the word "little" (I'm sure Spider-Man fans would draw and quarter me for that), but my perception is that if the movie earns its dramatic deaths then it's something we'll return to in the future, and if just the knowledge of the death (or the reveal, or whatever it is) is enough to make us not want to go back, then, again, maybe there just wasn't enough there. The Amazing Spider-Man 2 wouldn't be ruined by knowing about Gwen Stacy's death any more than by its scatterbrained storytelling. The third and for me most interesting type of spoiler is the interpretation of a movie that ruins it for you. These can obviously only work after the movie has come out. The one I keep coming back to recently is the idea that Trainwreck is overpopulated by improv scenes that just go on too long. This has basically made me not want to see the movie. Maybe if I saw it I'd have my own, different opinion, but for now it has "ruined" the movie in the sense that I've lost interest in seeing it. Because I'm a jerk, I also take great pride in the knowledge that I've ruined the movie 27 Dresses for several of my friends and family by pointed out how the main character's entire life revolves around a discomforting worship of heteronormativity and the implications for anyone with any interest in feminism. What I'm trying to get at is the idea that pointing out structural or thematic flaws is often more devastating in the long run than plot points or twists, but that's not what we're worried about when we talk about spoilers. I think our culture's current aversion to plot spoilers has grown out of the fact that there are so many movies coming out all the time that we don't make time for rewatches anymore. We want to preserve the impact of the first-time watch because we might not ever give movies a second chance, even if they deserve one. Obviously spoilers are different for everyone, and I think the best thing we can all do is stay away from spoilers if we're afraid of them and mark content as not spoiler-free if we're publishing them. But next time you hear someone say "spoiler alert" or you check in with your favorite movie news publication, pause and ask yourself, "Is this really going to ruin the movie? Or does it have more to do with how we watch movies?"